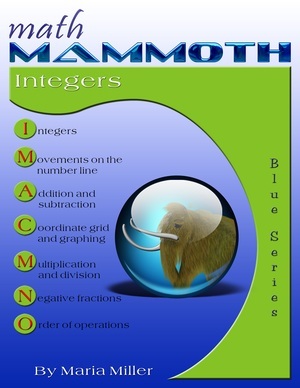 Math Mammoth Integers worktext covers all important integer (signed numbers) topics for middle school (grades 6-8), with instructions written directly to the student. Thus, it requires very little teacher or parent involvement. Integers are introduced using the number line to relate them to the concepts of temperature, elevation, and money. We also study briefly the ideas of absolute value (an integer's distance from zero) and the opposite of a number. Adding and subtracting integers is presented through two main models: (1) movements along the number line and (2) positive and negative counters. 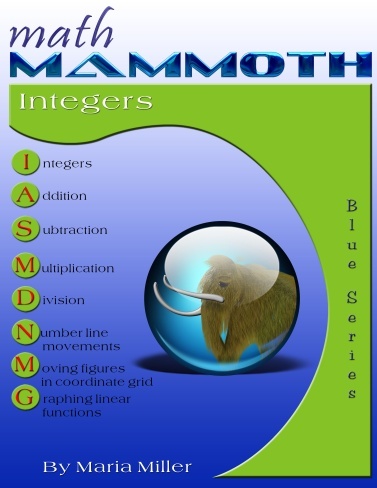 With the help of these models, students should not only learn the shortcuts, or rules, for adding and subtracting integers, but also understand why these shortcuts work. A lesson about subtracting integers explains the shortcut for subtracting a negative integer using three different viewpoints (counters, number-line movements, and as a distance or difference). There is also a roundup lesson for addition and subtraction of integers. Next, students learn to locate points in all four quadrants of the coordinate plane and how the coordinates of a figure change when it is reflected across the x or y-axis. Students also move points according to given instructions, and find distances between points with the same first coordinate or the same second coordinate. Multiplication and division of integers is explained, first of all using counters, and then relying on the properties of multiplication and division. We use multiplication and division in the context of enlarging or shrinking geometric figures in the coordinate grid. These lessons also include a few simple equations, problems with several operations, and fun riddles. The last section of lessons in this book deals with graphing. Students plot points on the coordinate grid according to a given equation in two variables (such as y = x + 2), this time also using negative numbers. They see the patterns in the coordinates of the points and the pattern in the points drawn in the grid, and also work through some real-life problems. The book ends with two review lessons. I have also created a set of free video lessons to match this book. I appreciate your approach when you explain a topic. From time to time you approach a topic differently than I do (e.g. long division, integers) and your explanation teaches me something new and gives my children a different perspective. I taught upper elementary math for 10 years in the classroom and now for 3 years at home with my own kids and I love learning a new strategy. And, now that my son is working independently through your books, for example Integers, I love that he is working with your explanations and is exposed to more than just "mom's" way to work it out. These multiple problem solving strategies in his bag of tricks help him succeed no matter what he is working on. Thank you!